10 A None No Power Seat 10 A is a standard Business Class seat. This seat in the upper deck has advantages including a quieter cabin, usually more personalized attention, and a storage box near the window. The drawbacks are less overhead space and climbing the stairs. 10 B None No Power Seat 10 B is a standard Business Class seat. This seat in the upper deck has advantages including a quieter cabin and usually more personalized attention. The drawbacks are less overhead space and climbing the stairs. 10 J None No Power Seat 10 J is a standard Business Class seat. This seat in the upper deck has advantages including a quieter cabin and usually more personalized attention. The drawbacks are less overhead space and climbing the stairs. 10 K None No Power Seat 10 K is a standard Business Class seat. This seat in the upper deck has advantages including a quieter cabin, usually more personalized attention, and a storage box near the window. The drawbacks are less overhead space and climbing the stairs. 11 A None No Power Seat 11 A is a Business Class seat, although proximity to the galley and stairs may be bothersome. This seat in the upper deck has advantages including a quieter cabin, usually more personalized attention, and a storage box near the window. The drawbacks are less overhead space and climbing the stairs. 11 B None No Power Seat 11 B is a Business Class seat, although the proximity to the galley and stairs may be bothersome. This seat in the upper deck has advantages including a quieter cabin and usually more personalized attention. The drawbacks are less overhead space and climbing the stairs. 11 J None No Power Seat 11 J is a Business Class seat, although the proximity to the galley and stairs may be bothersome. This seat in the upper deck has advantages including a quieter cabin and usually more personalized attention. The drawbacks are less overhead space and climbing the stairs. 11 K None No Power Seat 11 K is a Business Class seat, although proximity to the galley and stairs may be bothersome. This seat in the upper deck has advantages including a quieter cabin, usually more personalized attention, and a storage box near the window. The drawbacks are less overhead space and climbing the stairs. 17 A None No Power Seat 17 A is a Business Class bulkhead seat with extra legroom due to the position of the bulkhead. The proximity of the lavatory and galley may be bothersome. There is no floor storage for this seat during take-off and landing. Passengers with infants are usually seated here. 17 B None No Power Seat 17 B is a Business Class bulkhead seat with extra legroom due to the position of the bulkhead. The proximity of the lavatory and galley may be bothersome. There is no floor storage for this seat during take-off and landing. Passengers with infants are usually seated here. 17 D None No Power Seat 17 D is a Business Class bulkhead seat with extra legroom due to the position of the bulkhead. The proximity of the lavatory and galley may be bothersome. There is no floor storage for this seat during take-off and landing. Passengers with infants are usually seated here. 17 E None No Power Seat 17 E is a Business Class bulkhead seat with extra legroom due to the position of the bulkhead. The proximity of the lavatory and galley may be bothersome. There is no floor storage for this seat during take-off and landing. Passengers with infants are usually seated here. 17 F None No Power Seat 17 F is a Business Class bulkhead seat with extra legroom due to the position of the bulkhead. The proximity of the lavatory and galley may be bothersome. There is no floor storage for this seat during take-off and landing. Passengers with infants are usually seated here. 17 J None No Power Seat 17 J is a Business Class bulkhead seat with extra legroom due to the position of the bulkhead. The proximity of the lavatory and galley may be bothersome. There is no floor storage for this seat during take-off and landing. Passengers with infants are usually seated here. 17 K None No Power Seat 17 K is a Business Class bulkhead seat with extra legroom due to the position of the bulkhead. The proximity of the lavatory and galley may be bothersome. There is no floor storage for this seat during take-off and landing. Passengers with infants are usually seated here. 18 B None No Power Seat 18 B is a standard Business Class seat. 19 B None No Power Seat 19 B is a standard Business Class seat. 19 D None No Power Seat 19 D is in the last row of Business Class and has limited recline. Proximity to the lavatory may be bothersome. 19 E None No Power Seat 19 E is in the last row of Business Class and has limited recline. Proximity to the lavatory may be bothersome. 19 F None No Power Seat 19 F is in the last row of Business Class and has limited recline. Proximity to the lavatory may be bothersome. 20 A None No Power Seat 20 A is in the last row of Business Class and has limited recline. Proximity to the lavatory may be bothersome. 20 B None No Power Seat 20 B is in the last row of Business Class and has limited recline. Proximity to the lavatory may be bothersome. 20 J None No Power Seat 20 J is in the last row of Business Class and has limited recline. Proximity to the lavatory may be bothersome. 20 K None No Power Seat 20 K is in the last row of Business Class and has limited recline. Proximity to the lavatory may be bothersome. 28 A None No Power Seat 28 A has restricted legroom due to the position of the bulkhead. The proximity to the galley and stairs may be bothersome. Passengers with infants are often seated at this bulkhead. The tray tables are in the armrests making the armrest immovable and slightly reducing seat width. There is no floor storage for this seat during take-off and landing. 28 B None No Power Seat 28 B has restricted legroom due to the position of the bulkhead. The proximity to the galley and stairs may be bothersome. Passengers with infants are often seated at this bulkhead. The tray tables are in the armrests making the armrest immovable and slightly reducing seat width. There is no floor storage for this seat during take-off and landing. 29 A None No Power Seat 29 A is misaligned with the row ahead so legroom is restricted. 29 B None No Power Seat 29 B is misaligned with the row ahead so legroom is restricted. 29 C None No Power Seat 29 C is misaligned with the row ahead so legroom is restricted. 29 H None No Power Seat 29 H has extra legroom due to the position of the bulkhead. The proximity to the galley may be bothersome. Passengers with infants are often seated here. The tray tables are in the armrests making the armrest immovable and slightly reducing seat width. There is no floor storage for this seat during take-off and landing. 29 J None No Power Seat 29 J has extra legroom due to the position of the bulkhead. The proximity to the galley may be bothersome. Passengers with infants are often seated here. The tray tables are in the armrests making the armrest immovable and slightly reducing seat width. There is no floor storage for this seat during take-off and landing. 29 K None No Power Seat 29 K has extra legroom due to the position of the bulkhead. The proximity to the galley may be bothersome. Passengers with infants are often seated here. The tray tables are in the armrests making the armrest immovable and slightly reducing seat width. There is no floor storage for this seat during take-off and landing. 30 D None No Power Seat 30 D has limited legroom due to the position of the bulkhead. The proximity to the galley may be bothersome. Passengers with infants are often seated here. The tray tables are in the armrests making the armrest immovable and slightly reducing seat width. There is no floor storage for this seat during take-off and landing. 30 E None No Power Seat 30 E has limited legroom due to the position of the bulkhead. The proximity to the galley may be bothersome. Passengers with infants are often seated here. The tray tables are in the armrests making the armrest immovable and slightly reducing seat width. There is no floor storage for this seat during take-off and landing. 30 F None No Power Seat 30 F has limited legroom due to the position of the bulkhead. The proximity to the galley may be bothersome. Passengers with infants are often seated here. The tray tables are in the armrests making the armrest immovable and slightly reducing seat width. There is no floor storage for this seat during take-off and landing. 30 G None No Power Seat 30 G has limited legroom due to the position of the bulkhead. The proximity to the galley may be bothersome. Passengers with infants are often seated here. The tray tables are in the armrests making the armrest immovable and slightly reducing seat width. There is no floor storage for this seat during take-off and landing. 31 E None No Power Seat 31 E is an Economy Class seat, however this seat has limited under-seat leg and storage room due to the presence of an entertainment equipment box. 31 F None No Power Seat 31 F is an Economy Class seat, however this seat has limited under-seat leg and storage room due to the presence of an entertainment equipment box. 32 E None No Power Seat 32 E is an Economy Class seat, however this seat has limited under-seat leg and storage room due to the presence of an entertainment equipment box. 32 F None No Power Seat 32 F is an Economy Class seat, however this seat has limited under-seat leg and storage room due to the presence of an entertainment equipment box. 33 E None No Power Seat 33 E is an Economy Class seat, however this seat has limited under-seat leg and storage room due to the presence of an entertainment equipment box. 33 F None No Power Seat 33 F is an Economy Class seat, however this seat has limited under-seat leg and storage room due to the presence of an entertainment equipment box. 34 E None No Power Seat 34 E is an Economy Class seat, however this seat has limited under-seat leg and storage room due to the presence of an entertainment equipment box. 34 F None No Power Seat 34 F is an Economy Class seat, however this seat has limited under-seat leg and storage room due to the presence of an entertainment equipment box. 35 E None No Power Seat 35 E is an Economy Class seat, however this seat has limited under-seat leg and storage room due to the presence of an entertainment equipment box. 35 F None No Power Seat 35 F is an Economy Class seat, however this seat has limited under-seat leg and storage room due to the presence of an entertainment equipment box. 36 D None No Power Seat 36 D may have limited recline. The proximity to the lavatories may be bothersome. 36 E None No Power Seat 36 E may have limited recline. The proximity to the lavatories may be bothersome. This seat has limited under-seat leg and storage room due to the presence of an entertainment equipment box. 36 F None No Power Seat 36 F may have limited recline. The proximity to the lavatories may be bothersome. This seat has limited under-seat leg and storage room due to the presence of an entertainment equipment box. 36 G None No Power Seat 36 G may have limited recline. The proximity to the lavatories may be bothersome. 37 A None No Power Seat 37 A has limited recline and proximity to the lavatory may be bothersome. 37 B None No Power Seat 37 B has limited recline and proximity to the lavatory may be bothersome. 37 C None No Power Seat 37 C has limited recline and proximity to the lavatory may be bothersome. 37 H None No Power Seat 37 H has limited recline and proximity to the lavatory may be bothersome. 37 J None No Power Seat 37 J has limited recline and proximity to the lavatory may be bothersome. 37 K None No Power Seat 37 K has limited recline and proximity to the lavatory may be bothersome. 38 A None No Power Seat 38 A has extra legroom. The proximity to the lavatories may be bothersome, and it can get very cold by the exit during flight. The tray table is in the armrest, making the armrest immovable and slightly reducing seat width. There is no floor storage for this seat during take-off and landing. 38 B None No Power Seat 38 B has extra legroom due to the exit row but it can get cold by the exit during flight. The proximity to the lavatories may be bothersome. The tray table is in the armrest, making the armrest immovable and slightly reducing seat width. There is no floor storage for this seat during take-off and landing. 38 C None No Power Seat 38 C has extra legroom due to the exit row but it can get cold by the exit during flight. The proximity to the lavatories may be bothersome. The tray table is in the armrest, making the armrest immovable and slightly reducing seat width. There is no floor storage for this seat during take-off and landing. 38 D None No Power Seat 38 D has extra legroom due to the position of the bulkhead. The proximity to the lavatories may be bothersome. Passengers with infants are often seated in this row. The tray table is in the armrest, making the armrest immovable and slightly reducing seat width. There is no floor storage for this seat during take-off and landing. 38 E None No Power Seat 38 E has extra legroom due to the position of the bulkhead. The proximity to the lavatories may be bothersome. Passengers with infants are often seated in this row. The tray table is in the armrest, making the armrest immovable and slightly reducing seat width. There is no floor storage for this seat during take-off and landing. 38 F None No Power Seat 38 F has extra legroom due to the position of the bulkhead. The proximity to the lavatories may be bothersome. Passengers with infants are often seated in this row. The tray table is in the armrest, making the armrest immovable and slightly reducing seat width. There is no floor storage for this seat during take-off and landing. 38 G None No Power Seat 38 G has extra legroom due to the position of the bulkhead. The proximity to the lavatories may be bothersome. Passengers with infants are often seated in this row. The tray table is in the armrest, making the armrest immovable and slightly reducing seat width. There is no floor storage for this seat during take-off and landing. 38 H None No Power Seat 38 H has extra legroom due to the exit row but it can get cold by the exit during flight. The proximity to the lavatories may be bothersome. The tray table is in the armrest, making the armrest immovable and slightly reducing seat width. There is no floor storage for this seat during take-off and landing. 38 J None No Power Seat 38 J has extra legroom due to the exit row but it can get cold by the exit during flight. The proximity to the lavatories may be bothersome. The tray table is in the armrest, making the armrest immovable and slightly reducing seat width. There is no floor storage for this seat during take-off and landing. 38 K None No Power Seat 38 K has extra legroom. The proximity to the lavatories may be bothersome, and it can get very cold by the exit during flight. The tray table is in the armrest, making the armrest immovable and slightly reducing seat width. There is no floor storage for this seat during take-off and landing. 39 E None No Power Seat 39 E is an Economy Class seat, however this seat has limited under-seat leg and storage room due to the presence of an entertainment equipment box. 39 F None No Power Seat 39 F is an Economy Class seat, however this seat has limited under-seat leg and storage room due to the presence of an entertainment equipment box. 40 E None No Power Seat 40 E is an Economy Class seat, however this seat has limited under-seat leg and storage room due to the presence of an entertainment equipment box. 40 F None No Power Seat 40 F is an Economy Class seat, however this seat has limited under-seat leg and storage room due to the presence of an entertainment equipment box. 41 E None No Power Seat 41 E is an Economy Class seat, however this seat has limited under-seat leg and storage room due to the presence of an entertainment equipment box. 41 F None No Power Seat 41 F is an Economy Class seat, however this seat has limited under-seat leg and storage room due to the presence of an entertainment equipment box. 42 E None No Power Seat 42 E is an Economy Class seat, however this seat has limited under-seat leg and storage room due to the presence of an entertainment equipment box. 42 F None No Power Seat 42 F is an Economy Class seat, however this seat has limited under-seat leg and storage room due to the presence of an entertainment equipment box. 43 E None No Power Seat 43 E is an Economy Class seat, however this seat has limited under-seat leg and storage room due to the presence of an entertainment equipment box. 43 F None No Power Seat 43 F is an Economy Class seat, however this seat has limited under-seat leg and storage room due to the presence of an entertainment equipment box. 44 E None No Power Seat 44 E is an Economy Class seat, however this seat has limited under-seat leg and storage room due to the presence of an entertainment equipment box. 44 F None No Power Seat 44 F is an Economy Class seat, however this seat has limited under-seat leg and storage room due to the presence of an entertainment equipment box. 45 E None No Power Seat 45 E is an Economy Class seat, however this seat has limited under-seat leg and storage room due to the presence of an entertainment equipment box. 45 F None No Power Seat 45 F is an Economy Class seat, however this seat has limited under-seat leg and storage room due to the presence of an entertainment equipment box. 46 A None No Power Seat 46 A may have limited recline. Proximity to the lavatory and galley may be bothersome. 46 B None No Power Seat 46 B may have limited recline. Proximity to the lavatory and galley may be bothersome. 46 C None No Power Seat 46 C may have limited recline. Proximity to the lavatory and galley may be bothersome. 46 D None No Power Seat 46 D may have limited recline. Proximity to the lavatory and galley may be bothersome. 46 E None No Power Seat 46 E may have limited recline. Proximity to the lavatory and galley may be bothersome. This seat has limited under-seat leg and storage room due to the presence of an entertainment equipment box. 46 F None No Power Seat 46 F may have limited recline. Proximity to the lavatory and galley may be bothersome. This seat has limited under-seat leg and storage room due to the presence of an entertainment equipment box. 46 G None No Power Seat 46 G may have limited recline. Proximity to the lavatory and galley may be bothersome. 46 H None No Power Seat 46 H may have limited recline. Proximity to the lavatory and galley may be bothersome. 46 J None No Power Seat 46 J may have limited recline. Proximity to the lavatory and galley may be bothersome. 46 K None No Power Seat 46 K may have limited recline. Proximity to the lavatory and galley may be bothersome. 47 A None No Power Seat 47 A has some extra legroom due to the Exit Row in front, however the close proximity to the lavatories and galleys may be bothersome. The tray table and personal TV are in the armrest, making the armrest immovable and slightly reducing seat width. There is no floor storage for this seat during take-off and landing. 47 B None No Power Seat 47 B has some extra legroom due to the Exit Row in front, however the close proximity to the lavatories and galleys may be bothersome. The tray table and personal TV are in the armrest, making the armrest immovable and slightly reducing seat width. There is no floor storage for this seat during take-off and landing. 47 C None No Power Seat 47 C has some extra legroom due to the Exit Row in front, however the close proximity to the lavatories and galleys may be bothersome. The tray table and personal TV are in the armrest, making the armrest immovable and slightly reducing seat width. There is no floor storage for this seat during take-off and landing. 47 H None No Power Seat 47 H has some extra legroom due to the Exit Row in front, however the close proximity to the lavatories and galleys may be bothersome. The tray table and personal TV are in the armrest, making the armrest immovable and slightly reducing seat width. There is no floor storage for this seat during take-off and landing. 47 J None No Power Seat 47 J has some extra legroom due to the Exit Row in front, however the close proximity to the lavatories and galleys may be bothersome. The tray table and personal TV are in the armrest, making the armrest immovable and slightly reducing seat width. There is no floor storage for this seat during take-off and landing. 47 K None No Power Seat 47 K has some extra legroom due to the Exit Row in front, however the close proximity to the lavatories and galleys may be bothersome. The tray table and personal TV are in the armrest, making the armrest immovable and slightly reducing seat width. There is no floor storage for this seat during take-off and landing. 48 C None No Power Seat 48 C is a standard Economy Class seat, however the close proximity to the galleys may be bothersome. 48 H None No Power Seat 48 H is a standard Economy Class seat, however the close proximity to the galleys may be bothersome. 49 C None No Power Seat 49 C is a standard Economy Class seat, however the close proximity to the galleys may be bothersome. 49 H None No Power Seat 49 H is a standard Economy Class seat, however the close proximity to the galleys may be bothersome. 5 D None No Power Seat 5 D is a standard First Class seat. This seat can be ideal when traveling with a partner. 5 G None No Power Seat 5 G is a standard First Class seat. This seat can be ideal when traveling with a partner. 50 C None No Power Seat 50 C is a standard Economy Class seat, however the close proximity to the galleys may be bothersome. 50 H None No Power Seat 50 H is a standard Economy Class seat, however the close proximity to the galleys may be bothersome. 51 D None No Power Seat 51 D has restricted legroom due to the position of the bulkhead. The proximity to the galley may be bothersome. Passengers with infants are often seated at this bulkhead. The tray table and personal TV are in the armrest, making the armrest immovable and slightly reducing seat width. There is no floor storage for this seat during take-off and landing. 51 E None No Power Seat 51 E has restricted legroom due to the position of the bulkhead. The proximity to the galley may be bothersome. Passengers with infants are often seated at this bulkhead. The tray table and personal TV are in the armrest, making the armrest immovable and slightly reducing seat width. There is no floor storage for this seat during take-off and landing. 51 F None No Power Seat 51 F has restricted legroom due to the position of the bulkhead. The proximity to the galley may be bothersome. Passengers with infants are often seated at this bulkhead. The tray table and personal TV are in the armrest, making the armrest immovable and slightly reducing seat width. There is no floor storage for this seat during take-off and landing. 51 G None No Power Seat 51 G has restricted legroom due to the position of the bulkhead. The proximity to the galley may be bothersome. Passengers with infants are often seated at this bulkhead. The tray table and personal TV are in the armrest, making the armrest immovable and slightly reducing seat width. There is no floor storage for this seat during take-off and landing. 52 E None No Power Seat 52 E is an Economy Class seat, however this seat has limited under-seat leg and storage room due to the presence of an entertainment equipment box. 52 F None No Power Seat 52 F is an Economy Class seat, however this seat has limited under-seat leg and storage room due to the presence of an entertainment equipment box. 53 E None No Power Seat 53 E is an Economy Class seat, however this seat has limited under-seat leg and storage room due to the presence of an entertainment equipment box. 53 F None No Power Seat 53 F is an Economy Class seat, however this seat has limited under-seat leg and storage room due to the presence of an entertainment equipment box. 54 E None No Power Seat 54 E is an Economy Class seat, however this seat has limited under-seat leg and storage room due to the presence of an entertainment equipment box. 54 F None No Power Seat 54 F is an Economy Class seat, however this seat has limited under-seat leg and storage room due to the presence of an entertainment equipment box. 55 E None No Power Seat 55 E is an Economy Class seat, however this seat has limited under-seat leg and storage room due to the presence of an entertainment equipment box. 55 F None No Power Seat 55 F is an Economy Class seat, however this seat has limited under-seat leg and storage room due to the presence of an entertainment equipment box. 56 E None No Power Seat 56 E is an Economy Class seat, however this seat has limited under-seat leg and storage room due to the presence of an entertainment equipment box. 56 F None No Power Seat 56 F is an Economy Class seat, however this seat has limited under-seat leg and storage room due to the presence of an entertainment equipment box. 57 E None No Power Seat 57 E is an Economy Class seat, however this seat has limited under-seat leg and storage room due to the presence of an entertainment equipment box. 57 F None No Power Seat 57 F is an Economy Class seat, however this seat has limited under-seat leg and storage room due to the presence of an entertainment equipment box. 58 A None No Power Seat 58 A is a standard Economy Class seat, however this row may feel cramped due to the curvature of the aircraft. 58 B None No Power Seat 58 B is a standard Economy Class seat, however this row may feel cramped due to the curvature of the aircraft. 58 C None No Power Seat 58 C is a standard Economy Class seat, however this row may feel cramped due to the curvature of the aircraft. 58 E None No Power Seat 58 E is an Economy Class seat, however this seat has limited under-seat leg and storage room due to the presence of an entertainment equipment box. 58 F None No Power Seat 58 F is an Economy Class seat, however this seat has limited under-seat leg and storage room due to the presence of an entertainment equipment box. 58 H None No Power Seat 58 H is a standard Economy Class seat, however this row may feel cramped due to the curvature of the aircraft. 58 J None No Power Seat 58 J is a standard Economy Class seat, however this row may feel cramped due to the curvature of the aircraft. 58 K None No Power Seat 58 K is a standard Economy Class seat, however this row may feel cramped due to the curvature of the aircraft. 59 B None No Power Seat 59 B is an Economy Class seat, however some passengers report this seat feels cramped due to the curvature of the fuselage. 59 E None No Power Seat 59 E is an Economy Class seat, however this seat has limited under-seat leg and storage room due to the presence of an entertainment equipment box. 59 F None No Power Seat 59 F is an Economy Class seat, however this seat has limited under-seat leg and storage room due to the presence of an entertainment equipment box. 59 J None No Power Seat 59 J is an Economy Class seat, however some passengers report this seat feels cramped due to the curvature of the fuselage. 6 A None No Power Seat 6 A is a standard Business Class seat. This seat in the upper deck has advantages including a quieter cabin, usually more personalized attention, and a storage box near the window. The drawbacks are less overhead space and climbing the stairs. 6 B None No Power Seat 6 B is a standard Business Class seat. This seat in the upper deck has advantages including a quieter cabin and usually more personalized attention. The drawbacks are less overhead space and climbing the stairs. 6 J None No Power Seat 6 J is a Business Class seat, however the close proximity to the lavatories may be bothersome. Passengers with infants are often seated here. This seat in the upper deck has advantages including a quieter cabin and usually more personalized attention. The drawbacks are less overhead space and climbing the stairs. 6 K None No Power Seat 6 K is a Business Class seat, however the close proximity to the lavatories may be bothersome. Passengers with infants are often seated here. This seat in the upper deck has advantages including a quieter cabin, usually more personalized attention, and a storage box near the window. The drawbacks are less overhead space and climbing the stairs. 60 B None No Power Seat 60 B is an Economy Class seat, however some passengers report this seat feels cramped due to the curvature of the fuselage. 60 E None No Power Seat 60 E is an Economy Class seat, however this seat has limited under-seat leg and storage room due to the presence of an entertainment equipment box. 60 F None No Power Seat 60 F is an Economy Class seat, however this seat has limited under-seat leg and storage room due to the presence of an entertainment equipment box. 60 J None No Power Seat 60 J is an Economy Class seat, however some passengers report this seat feels cramped due to the curvature of the fuselage. 61 B None No Power Seat 61 B is an Economy Class seat, however some passengers report this seat feels cramped due to the curvature of the fuselage. 61 E None No Power Seat 61 E is an Economy Class seat, however this seat has limited under-seat leg and storage room due to the presence of an entertainment equipment box. 61 F None No Power Seat 61 F is an Economy Class seat, however this seat has limited under-seat leg and storage room due to the presence of an entertainment equipment box. 61 J None No Power Seat 61 J is an Economy Class seat, however some passengers report this seat feels cramped due to the curvature of the fuselage. 62 B None No Power Seat 62 B feels cramped due to the curvature of the aircraft. Proximity to the lavatories may be bothersome. 62 C None No Power Seat 62 C feels cramped due to the curvature of the aircraft. Proximity to the lavatories may be bothersome. 62 D None No Power Seat 62 D is a standard Economy Class seat, although proximity to the lavatories may be bothersome. 62 E None No Power Seat 62 E is an Economy Class seat, however this seat has limited under-seat leg and storage room due to the presence of an entertainment equipment box. 62 F None No Power Seat 62 F is an Economy Class seat, however this seat has limited under-seat leg and storage room due to the presence of an entertainment equipment box. 62 G None No Power Seat 62 G is a standard Economy Class seat, although proximity to the lavatories may be bothersome. 62 H None No Power Seat 62 H feels cramped due to the curvature of the aircraft. Proximity to the lavatories may be bothersome. 62 J None No Power Seat 62 J feels cramped due to the curvature of the aircraft. Proximity to the lavatories may be bothersome. 63 D None No Power Seat 63 D is in the last row of the plane and has limited recline. This seat often feels cramped due to the curvature of the plane. The proximity of the lavatories may be bothersome. 63 E None No Power Seat 63 E is in the last row of the plane and has limited recline. This seat often feels cramped due to the curvature of the plane. The proximity of the lavatories may be bothersome. This seat has limited under-seat leg and storage room due to the presence of an entertainment equipment box. 63 F None No Power Seat 63 F is in the last row of the plane and has limited recline. This seat often feels cramped due to the curvature of the plane. The proximity of the lavatories may be bothersome. This seat has limited under-seat leg and storage room due to the presence of an entertainment equipment box. 63 G None No Power Seat 63 G is in the last row of the plane and has limited recline. This seat often feels cramped due to the curvature of the plane. The proximity of the lavatories may be bothersome. 7 A None No Power Seat 7 A is a standard Business Class seat. This seat in the upper deck has advantages including a quieter cabin, usually more personalized attention, and a storage box near the window. The drawbacks are less overhead space and climbing the stairs. 7 B None No Power Seat 7 B is a standard Business Class seat. This seat in the upper deck has advantages including a quieter cabin and usually more personalized attention. The drawbacks are less overhead space and climbing the stairs. 7 J None No Power Seat 7 J is a standard Business Class seat. This seat in the upper deck has advantages including a quieter cabin and usually more personalized attention. The drawbacks are less overhead space and climbing the stairs. 7 K None No Power Seat 7 K is a standard Business Class seat. This seat in the upper deck has advantages including a quieter cabin, usually more personalized attention, and a storage box near the window. The drawbacks are less overhead space and climbing the stairs. 8 A None No Power Seat 8 A is a Business Class seat which may have limited recline due to the exit behind. This seat in the upper deck has advantages including a quieter cabin, usually more personalized attention, and a storage box near the window. The drawbacks are less overhead space and climbing the stairs. 8 B None No Power Seat 8 B is a Business Class seat which may have limited recline due to the exit behind. This seat in the upper deck has advantages including a quieter cabin and usually more personalized attention. The drawbacks are less overhead space and climbing the stairs. 8 J None No Power Seat 8 J is a Business Class seat which may have limited recline due to the exit behind. 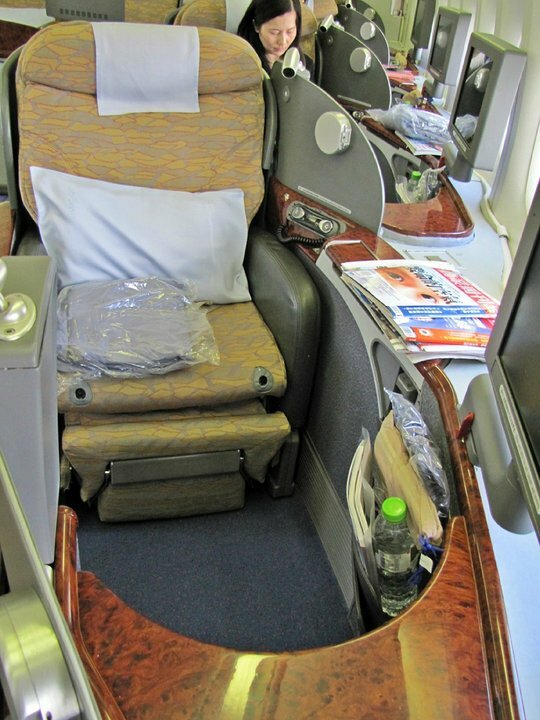 This seat in the upper deck has advantages including a quieter cabin and usually more personalized attention. The drawbacks are less overhead space and climbing the stairs. 8 K None No Power Seat 8 K is a Business Class seat which may have limited recline due to the exit behind. This seat in the upper deck has advantages including a quieter cabin, usually more personalized attention, and a storage box near the window. The drawbacks are less overhead space and climbing the stairs. 9 A None No Power Seat 9 A has extra legroom due to the exit row. This seat in the upper deck has advantages including a quieter cabin, usually more personalized attention, and a storage box near the window. The drawbacks are less overhead space and climbing the stairs. 9 B None No Power Seat 9 B has extra legroom due to the exit row. This seat in the upper deck has advantages including a quieter cabin and usually more personalized attention. The drawbacks are less overhead space and climbing the stairs. 9 J None No Power Seat 9 J has extra legroom due to the exit row. This seat in the upper deck has advantages including a quieter cabin and usually more personalized attention. The drawbacks are less overhead space and climbing the stairs. 9 K None No Power Seat 9 K has extra legroom due to the exit row. This seat in the upper deck has advantages including a quieter cabin, usually more personalized attention, and a storage box near the window. The drawbacks are less overhead space and climbing the stairs. Each seat features a personal TV with which plays entertainment selections on a loop. Each seat features a personal TV with audio and video on demand with choices of movies, short features, music channels, CDs, and video games. First class seats have a 15-inch adjustable personal TV and noise-canceling headphones. Dysnasty seats feature a 10.4-inch TV, and economy class has personal 6.5-inch LCD touchscreens. Each seat has a 110V AC power port. The B747-400 is the flagship of China Airlines' fleet and used on long-haul routes to Europe and the USA as well as shorter routes such as Japan. This version of the aircraft is the old configuration. China Airlines' B747-400 fleet is currently undergoing a complete interior refurbishment. Very nice seat, everything you could wish for. 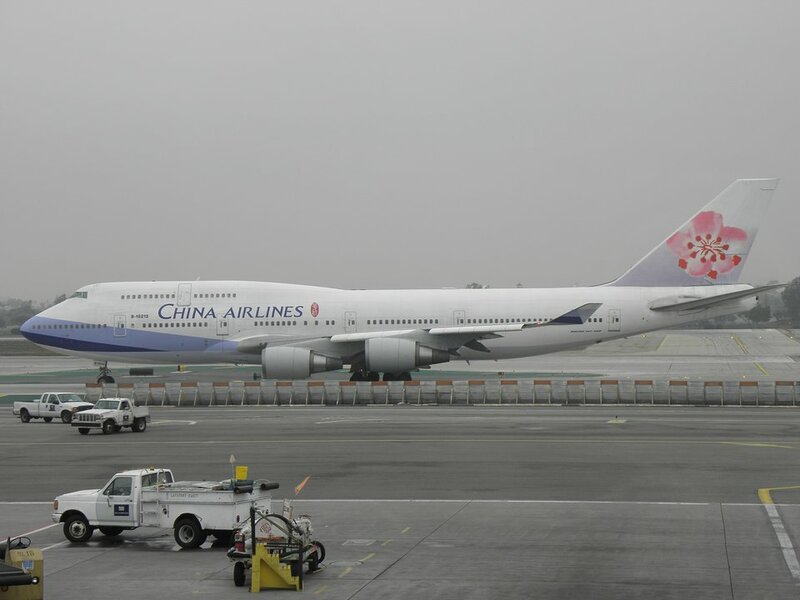 China Airlines sometimes operates these planes on routes where no First Class is offered (Frankfurt-Taipei in my latest case), in which case Business Class passengers can be lucky enough to get a seat in the very front. 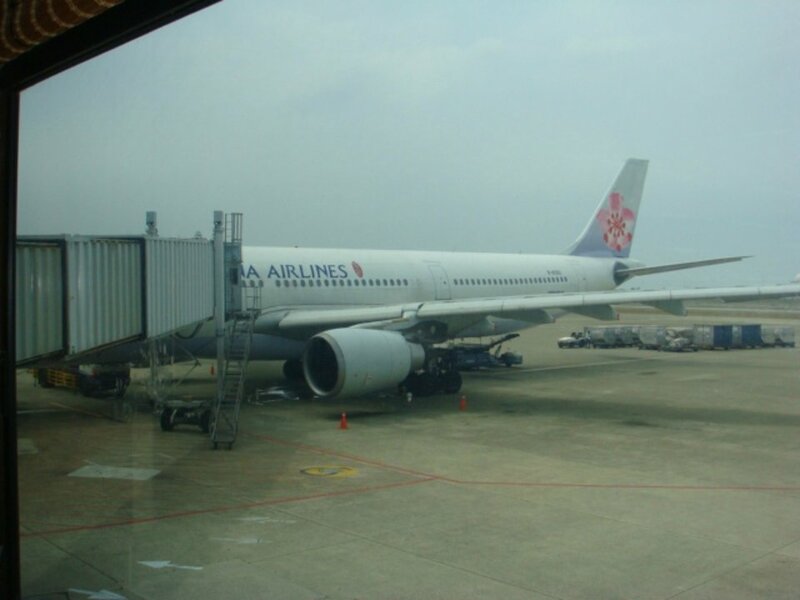 China Airlines flies 1 versions of .